Be prepared for auto troubles with quality emergency gear. It is packed with necessary auto and safety items in a handy clam-shell kit. 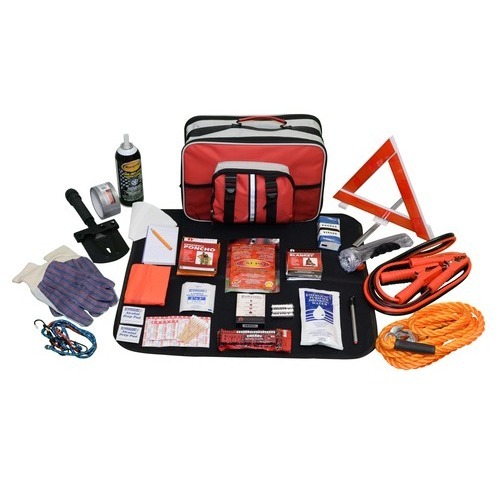 The kit is prepared with easy to use food and water supplies, light and communication gear, items to maintain body warmth, helpful tools for auto troubles, and first aid supplies. It is easily stored within a trunk or other space. Dimensions 14" x 10" x 8"
Light and Communications:These products come in handy during a home power outage, car trouble, or other emergency requiring you to leave your home. Multi-Function Auto Flashlight Shelter and Warmth: These supplies will provide protection from outside weather forces. They will protect you from wind, sun, rain, and other harsh conditions you may encounter.